In this lesson, we will learn how to describe the similarities and differences between infrasonic S-waves and P-waves and how they travel through the Earth's interior. Which of the following statements about S-Waves is not correct? CS-waves cannot travel through Earth’s core. 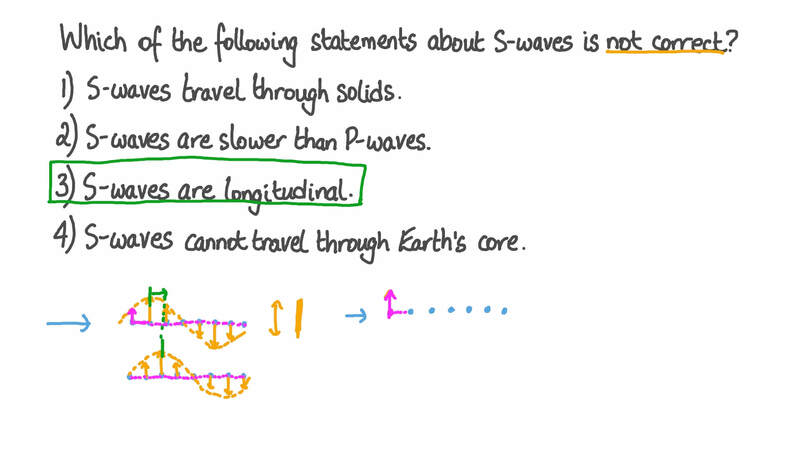 DS-waves are slower than P-waves. Which of the following statements about P-waves is not correct? AP-waves are slower than S-waves. The position of an earthquake’s epicenter is shown in the diagram. P-waves and S-waves are emitted from the epicenter. Three seismic sensor stations A, B, and C are shown. Which station will detect only S-waves? Which station will detect only P-waves? Which station will detect S-waves and P-waves? Which station will detect neither P-waves nor S-waves? The diagram shows the paths of P-waves and S-waves traveling through Earth from an earthquake epicenter. At each of the points 𝐴 , 𝐵 , 𝐶 , and 𝐷 , a wave is either transmitted, absorbed, reflected, or refracted. At 𝐴 , is the wave transmitted, absorbed, reflected, or refracted? At 𝐵 , is the wave transmitted, absorbed, reflected, or refracted? At 𝐶 , is the wave transmitted, absorbed, reflected, or refracted? At 𝐷 , is the wave transmitted, absorbed, reflected, or refracted? The Earth has two main layers below its crust; the core and the mantle. The core has an outer and inner region, as shown in the diagram. The temperature of and the pressure on the material in the mantle and the core increase with depth below the crust. Does the material of the mantle exist in a solid, liquid, or gaseous state? Does the material of the outer core exist in a solid, liquid, or gaseous state? Does the material of the inner core exist in a solid, liquid, or gaseous state?